IBASSIN: 2018 FLW Tour Lake St. Clair Day 2: Chad Grigsby Cracks 50-01lbs! 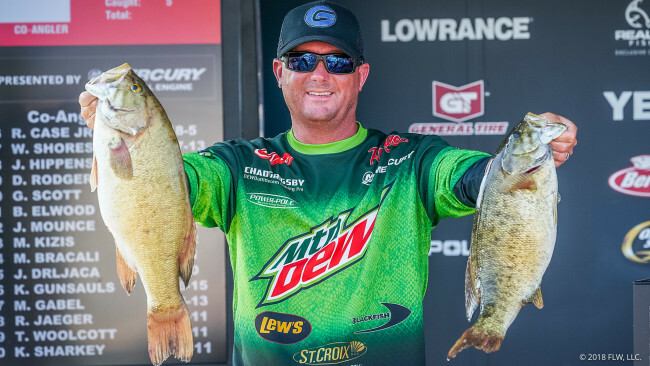 2018 FLW Tour Lake St. Clair Day 2: Chad Grigsby Cracks 50-01lbs! Chad Grigsby figured his only chance at making the Forrest Wood Cup was by winning at St. Clair. He’s halfway there, but he’s far from assured anything with the way the lake is fishing. 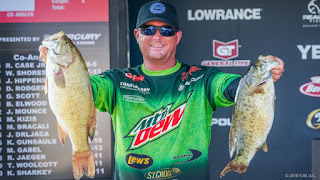 The Maple Grove, Minn., pro sacked up 24 pounds, 4 ounces to retain his lead at FLW Tour stop No. 7, which is presented by Mercury. That weight has him as the only pro to crack the 50-pound mark after two days (50-1, to be exact), but he only has a 4-ounce lead over Dylan Hays going into the weekend thanks to even more massive bags behind him. Weights typically drop on day two, and one would certainly expect that after a day one featuring 39 limits of more than 20 pounds. Instead, the fishing got even better. A total of 50 20-pound bags crossed the weigh-in stage today (36 pro, 14 co-angler), with Hays cracking the derby’s biggest bag at 26 pounds, 7 ounces. That said, Grigsby is pretty happy with how his tournament has gone so far. Like he did on day one, Grigsby made a key bait switch to something he hadn’t even thrown in practice – a smaller-profile, “super-finesse” bait – and immediately the bass told him he made the right choice, as he had all his weight by 10 a.m.
After that, he went looking to see if he could find any other areas near his on the southern section of Canadian waters, but was unable to really expand on his pattern or area. Fortunately, his area is pretty large, with a few sweet spots tucked in it. While the weather has cooperated thus far – today saw bluebird skies and dead-calm conditions – St. Clair is notorious for getting rough on weekends due to boat traffic. Considering he’s fishing the main lake, that could play a factor for Grigsby and much of the rest of the field, though he says he’s not worried. Ontario MNRF Spot Check Station a Welcome Sight!